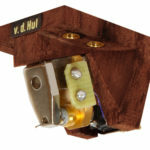 Jaguar is an authorized retailer for all Van Den Hul products. Van Den Hul's Crimson Stradivarius is a favorite in the Jaguar Reference System. The Crimson is the entry model into the Stradivarius reference line of cartridges and the most popular. The popularity is partly due to the fact that it's the most affordable, but also because it's the easiest to mate with a wide range of gear...bear in mind that the extreme levels of channel separation produced by the Colibri and Colibri Signature require the other equipment in the system to be matched very precisely. 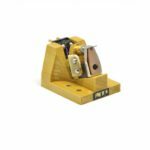 The CRIMSON is a top performance, custom, hand-built, moving coil phono cartridge, developed from a crossbreed of the Van Den Hul CANARY and CONDOR models. 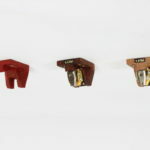 This cartridge is available in natural light wood color, dark wood and red-colored wood versions. Specific characteristics for this great cartridge are a relatively high (0,65mV) output, gold coils, a Samarium-Cobalt magnet, extended channel separation and superb tracking ability. 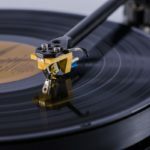 As the popularity of vinyl was reviving again, many requests came in to develop a High-End phono cartridge for a more affordable price than The COLIBRI. The CRIMSON is the result and probably one of the cartridges with the best value for money available. It is completely hand build by the Master, AJ Van Den Hul and comes with a free 200 hour fine-tune adjustment, which will optimize the suspension after the initial break-in changes. Special Edition CRIMSON XGA now available with Titanium & Amber Body & Gold Coils. See the Crimson in the Jaguar Online Store! Jaguar offers Free Priority Shipping and a 45-day free trial period; if The Crimson doesn't absolutely blow you away, send it back to us for a full refund (minus shipping and insurance). Please allow a minimum of 100hrs of break-in time, as the sonic signature of the cartridge will change dramatically during the break-in.